Google Trends is always a good place to start when you want some hard evidence on what is big and what is not at the moment. Xbox 360 users were always the favorite when it came to online surfer use, but it seems that the PS3 fan base has escalated and now seems on par with that of the Xbox 360’s player base. Xbox 360’s current dominance is largly down to the upcoming release of Kinect. But one thing Sony has over Microsoft is that they seem to be closing the gap, which is also due to the release of the PlayStation Move. In 2004, Google Trends indicate that searches were majorly higher for Xbox 360 than for the PS3, something that took a sudden U-turn at the tail end of 2006 where they ramped up the numbers. 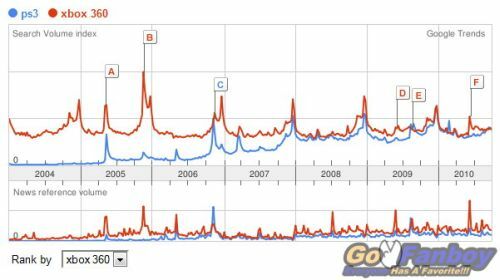 By Christmas 2007, searches for both consoles were almost level on par, Microsoft just taking the gold medal, with only two noticeable ‘spikes’ in search volumes in the entire graphs for the PlayStation 3. As you can see from the image, Xbox 360 users have made quite a few major increases, labelled A, B, D, E and F with PS3 taking the C during that tail end in 2006. The battle is still ongoing with Xbox and PlayStation fans, squabbling over who has the better console, and as you can see it does not seem to end here. Xbox 360 still wins! imagine that huh? 7800gtx v 1800XT, CELL BROADBAND IBM v XEXON x 3. That's all folks. Btw, ps3 uses nvidia card so tech fans know which one is the above and they used IBM/sony/samsung w/e join cpu and you'll know.. I don't think there is any argument which is best. The only argument is if Xbox360 is even relevant still. you got this from go fanboy? Previous article Google Car: The Final Piece in the Puzzle? Google Car: The Final Piece in the Puzzle?